As these winter temperatures get cold and I mean cold, all I want to do is be bundled up. But it's not always the cutest look. I'm usually in my heavy duty parka once it reaches twenty degrees or lower. I like to stay fashionable but how? My other go-to is a faux fur coat. It's warm, fashion forward, and versatile enough to take from day to night. A Faux fur coat is a classic item that has been around since fashion began. Today, it's trendy and I'm not mad at all because it's been keeping me warm this winter. Plus it's affordable. Some of my favorite faux fur styles are a cheetah pattern, multi-color, deep fall colors, and pretty pastels. The different styles are all so easy to wear and look fabulous with just about anything. Click on the links to see how I style the faux fur coats! I've linked several options below all under $100!! Shop away! Valentine's Day is right around the corner and if you're still looking for something to do, I know just the thing! Valentine's Day doesn't mean you have to spend it with a guy, I celebrate with my girls! 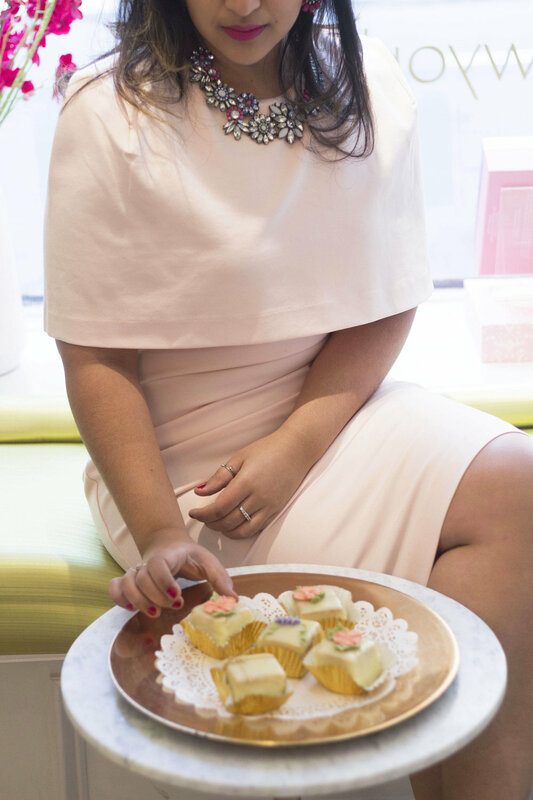 Bon Vivant Cake Café in the Upper East Side of NYC is the perfect spot to gather your gals for a great tea party! The have the most beautifully decorated yummy cakes as well as an amazing array of teas to go with them. The atmosphere of the cafe is adorable! I felt like I was transported to Paris! From the delicate flowers, pastel color palette, crystal chandeliers, amazing art, and the upbeat French music playing in the background. Every bite of the delicious cake made me forget about the craziness of New York, and took me to the romantic streets of France. Any holiday that I can dress up for, I love! Especially a holiday where pink and red are the most popular colors! If you've been following my blog for a while, you know I love a great dress! 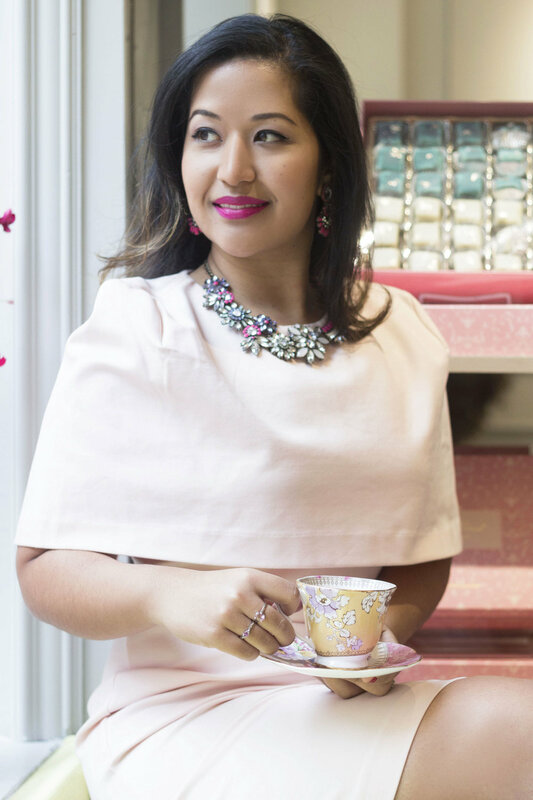 A pink dress is perfect for Valentine's Day and for a tea party. This Lulus caplet pencil dress is so comfortable and great for so many occasions (not just Vday)! I love the caplet detail- fashion forward and unique! I'm a huge fan of the longer lady like hem length too. Add on a statement necklace with a bold lip and you're set! If you're still looking for the perfect gift for your sweetie, whether it's your significant other or good friend, Bon Vivant New York has the cutest cake package for Valentines Day! I highly recommend the lemon zest flavor!! Pastel colors have been worn on repeat lately. I'm slowly adding colors to my closet, so it's not just black and white. Pastel colors are very subtle so it's great for anyone who doesn't want to wear loud colors. I love this Halston Heritage dress because of the great seaming details all throughout the dress. The diagonal seam lines curve from the top neck line all the way to the bottom hem, creating a great illusion for the eye. The dress also has great structure and fits incredibly to the body. It made me stand up straighter and felt so statue-esque in it. The pastel palette is one of my favorite color stories! I'm a girly girl and love the soft feeling of it. The colors look good on so many different skin tones which is amazing as well! Pastels are great for spring and summer. It's the perfect transition into the new season. These colors are great for summer weddings, workwear, and accent pieces. 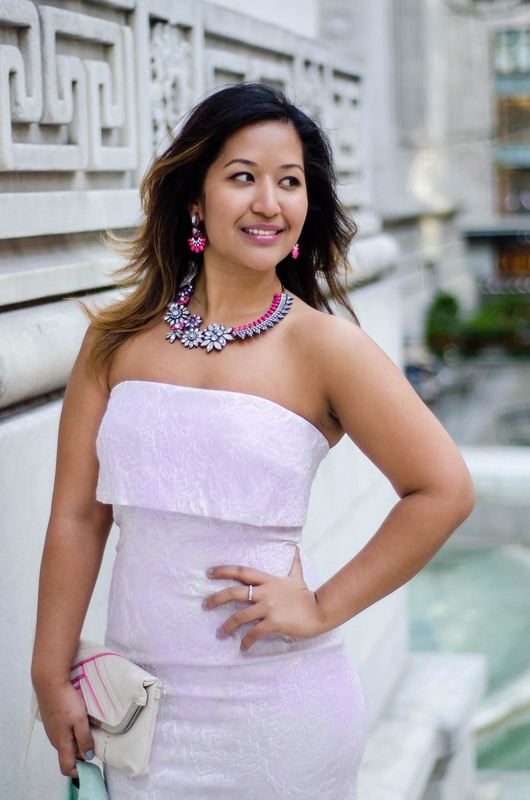 Here, I'm wearing a metallic brocade strapless dress in the perfect lilac color. I love soft metallic brocades like this because it adds just the right amount of shine without going overboard. As my readers might know already, I love mixing colors! So instead of going for a neutral colored jacket, I opted to wear this turquoise tweed motorcycle style blazer. This jacket style helps make the look feel casual, making it accessible to wear this dress to other occasions instead of just parties. I know it might be hard to get away from the black most of us usually wear but trust me, the pastel colors are worth giving a try.